Night Safari was the first night zoo in the world. It was developed by Singapore Zoological Gardens, and opened in 1994 – it has been visited by over 20 million people. The concept of a nocturnal zoo in Singapore was suggested in the 1980s by the former executive chairman of the Singapore Zoo, Dr Ong Swee Law. 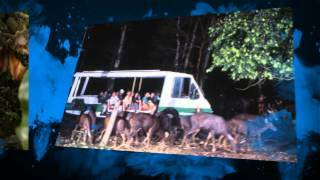 Constructed at a cost of S$63 million, Night Safari was officially opened on 26 May 1994. Night Safari occupies 35 hectares of secondary rainforest adjacent to the Singapore Zoo and Upper Seletar Reservoir. Simon Corder became involved in Night Safari almost by chance – he was designing a site-specific performance in the zoo for the Singapore Arts Festival in 1988 just when the team was being put together to masterplan what was then called ‘Asian Night Safari’. The Masterplan was completed towards the end of 1988, and development began the following year. Night Safari was immediately a great success and won numerous awards – including twelve times winner of the ‘best attraction’ category, from by the Singapore Tourism Board. Simon Corder delivered papers on the lighting of Night Safari to the American Zoo & Aquarium Association (AZA) annual meeting in Seattle in 1995, and the 5th International Symposium on Zoo Design, organised by Paignton Zoo, in 1999 (with Mike Graetz). In 2016 Simon Corder was invited to revisit Night Safari (photographs below). The original lighting system is still working well, 20 years on, and the aesthetic approach continues to be appropriate and effective. However, the time has arrived to review the habitat light sources with regard to developments in lighting technology since the 1990s – LEDs in particular. In May 2017 Simon Corder delivered a paper on the opportunities and issues around relighting Night Safari with LEDs at Showlight 2017 in Florence, Italy – the quadrennial international gathering of lighting professionals.